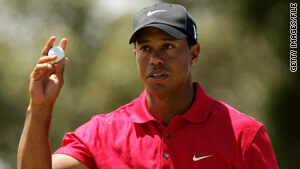 Tiger Woods: "After much soul searching, I have decided to take an indefinite break from professional golf." Woods: "I am deeply aware of the disappointment and hurt that my infidelity has caused"
Woods: "I would like to ask everyone ... for their understanding"
Woods: "I need to focus my attention on being a better husband, father and person"
"I am deeply aware of the disappointment and hurt that my infidelity has caused to so many people, most of all my wife and children. I want to say again to everyone that I am profoundly sorry and that I ask forgiveness. It may not be possible to repair the damage I've done, but I want to do my best to try. "I would like to ask everyone, including my fans, the good people at my foundation, business partners, the PGA Tour, and my fellow competitors, for their understanding. What's most important now is that my family has the time, privacy and safe haven we will need for personal healing. "After much soul searching, I have decided to take an indefinite break from professional golf. I need to focus my attention on being a better husband, father and person. "Again, I ask for privacy for my family and I am especially grateful for all those who have offered compassion and concern during this difficult period."